I could tell people I was not ‘thick’- but Dyslexic! My name is Donnie Macaskill, I have been told I started school in Glasgow, speaking only Gaelic. I found myself put in a corner with a non-English speaking girl. This was isolating enough but when it became clear that I had difficulties in understanding letters and writing, life at school became more and more unbearable. My inability to learn to read and write had me labelled as ‘unable to be educated‘. This label followed me throughout my school life and my school days were the worst days of my life. They set a pattern for my life, I worked in jobs that required little or no written work and changed jobs when the written work increased. This has left me with self-esteem issues which have surfaced in every area of my life. In my late 30’s I was encouraged to undergo testing for Dyslexia and I was actually relieved to be told that I was severely Dyslexic. At least I could tell people I was not ‘thick‘ – but Dyslexic! Although I have now taught myself to read and I am confident in my reading ability, my dyslexia means that I find writing almost impossible. I find forming letters and words very, very difficult and for me writing is a highly stressful, laborious task. I find it most frustrating that other people cannot seem to comprehend the anxiety and stress that being asked to write causes me. The Adult Network is a support group for people over 18 and are held four times a year in our Stirling office. As well as The Adult Network, there is a Glasgow Adult group that meet monthly at Strathclyde University. Your local branch may also hold regular meetings, as well as other activities and events. We would like to thank Donnie for sharing his compelling story. 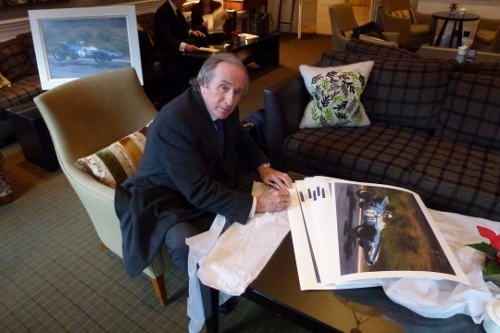 Scottish Contemporary Artist Jonathan Mitchell has donated an original Oil painting of Sir Jackie Stewart racing at the 1969 German Grand Prix in the Matra MS80. The Painting was commissioned in co-operation with our President Sir Jackie Stewart to raise fund and awareness for Dyslexia Scotland. The painting will be on display at a number of events between now and Dyslexia Awareness Week in November, when it will be auctioned off to the highest bidder. Checkout our Website, Facebook and Twitter pages, details of where you can view the painting will be available shortly. Make sure you see it, before it’s snapped up. In addition, a run of limited addition prints signed by Sir Jackie and Jonathan Mitchell are to be produced, you can pre order your print here before their official publication in May. We are very grateful for the artist’s generous donation. Visit www.jonathan-mitchell.co.uk to find out more about Jonathan Mitchell and view his other work. Remember, stay tuned for your opportunity to view this amazing painting.